Penn was an English real estate developer, philosopher, and founder of the Province of Pennsylvania in the British Colonies of North America. He was an early champion of republicanism and religious freedom. His good relations and treaties with the Lenape Indians were the most successful of all the colonial governors. The city of Philadelphia was planned and developed under his stewardship. His son, William, was born in London just prior to the admiral's departure for the Irish seas" indeed, he had already started down the Thames when the news of his son's birth reached him, and he hastily left his vessel and returned home. The family resided in Essex during the father's absence, and from his mother the boy acquired his strong religious faith. He was sent to a free grammar-school in Chigwell, thence in 1656 to a private school on Tower street, London, and during the residence of the family in Ireland he studied under a private tutor. Three years later he went to Christ church college, Oxford, where among his companions were Robert Spencer and John Locke. He soon acquired reputation as a hard student, a skillful oarsman, and an adventurous sportsman. His reading at this time was solid and extensive, and his acquisition of knowledge was assisted by an exceptional memory. He had an excellent; knowledge of history and theology, had read the chief writers of Greece and Italy in their native tongues, and possessed a thorough knowledge of French, German, Dutch, and Italian. After the restoration of the Stuarts, Thomas Lee, a follower of George Fox (q. v.), began to preach in Oxford against the threatened restoration of what he considered popish usages, such as the wearing of gowns, and soon numbered William Penn among his followers. Penn's absence from service was noticed, and with others he was brought up before the college authorities and fined. This roused the young nonconformists to open rebellion. They paraded the streets, refused to wear the gown, and tore away the vestment from those that did so. In all of these actions Penn was conspicuous, and he was expelled from the university. 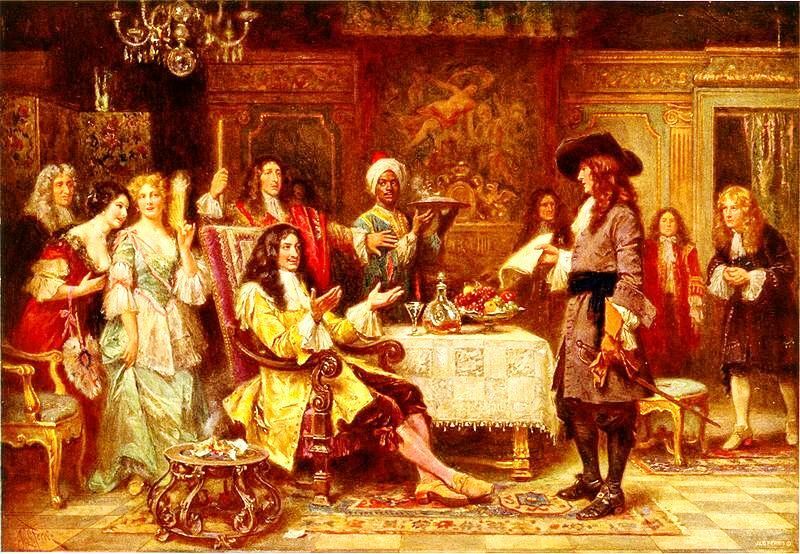 His father, seriously offended, at first showed great severity, but soon relented, and sent Penn to France, where he was presented to Louis XIV., and became a frequent and welcome guest at court. He mingled with the fashionable world, and bid fair to forget his Quaker fancies. In order to complete his education he placed himself under the tuition of Moses Amyrault, one of the ablest scholars of France and a member of the Reformed church. He remained at Saumur, and then traveled through France and Italy with Lord Robert Spencer, also meeting Algernon Sidney, to whom he became greatly attached. In 1644 he was recalled to England by his father, and taken to court, where he impressed the king by his behavior, and became a general favorite. His name was entered as a law-student at Lincoln's Inn, and for a time he also served on his father's staff, and was sent with dispatches from the fleet to the king. In 1665 the plague appeared in London, and the fear of death revived the religious fervor of the young law-student. He was sent to Ireland to superintend two estates that belonged to the family in the County Cork, and arrived in Dublin in the autumn of 1665 with letters to the Duke of Ormond, who was then viceroy. He was warmly received and gave himself up entirely to pleasure. During the insurrection of soldiers at Carrickfergus he served with credit as aide to Lord Arran, who was charged with the subjection of the mutineers, and he became so interested that he caused his portrait to be painted in armor in memory of the experience. The vignette shows him in this costume and is of value, being the only known likeness of him that was painted during his lifetime. He now desired to join the army, and it was proposed to his father that he should have command of a company of foot; but this the admiral refused. Penn then turned his attention to the family interests, and secured possession of Shangarry castle and estate for his father. While managing the newly acquired property, he heard by accident that his old Oxford acquaintance, Thomas Lee, was about to preach in Cork. Curiosity led him to the place of worship, and after listening to the sermon, unable to withstand its influence, he accepted the tenets of Quakerism. He then attended the meetings with regularity, and on 3 September, 1667, was made prisoner with the entire congregation and taken before the mayor of Cork on a charge of riot. The magistrate offered to release him, provided he would promise to keep the peace; but he refused, and was sent to jail. He wrote to the lord-president of Munster, giving an account of his arrest and detention, and an order was issued for his immediate discharge. Thereafter he identified himself completely with the Quakers in everything except dress, but it was not until the following year (1668) that he felt himself called to the ministry. "Truth Exalted, in a short but sure Testimony against all those religious Faiths and Worships that have been formed and followed in the darkness of Apostasy; and for that Glorious Light which is now risen and shines forth in the Life and Doctrine of the despised Quakers as the alone good old way of Life and Salvation. Presented to Princes, Priests, and People, that they may repent, believe, and obey. By William Penn, whom Divine Love constrains in an holy contempt to trample on Egypt's glory, not fearing the King's wrath, having beheld the Majesty of Him who is invisible" (1668). This was followed by a number of tracts on similar topics, which with his other writings were collected and published by Joseph Besse (2 vols., London, 1726). At this time he also obtained a promise from the Duke of Buckingham that the latter would bring a bill into parliament to do justice to the Quakers; but the commons refused to consider the measure. 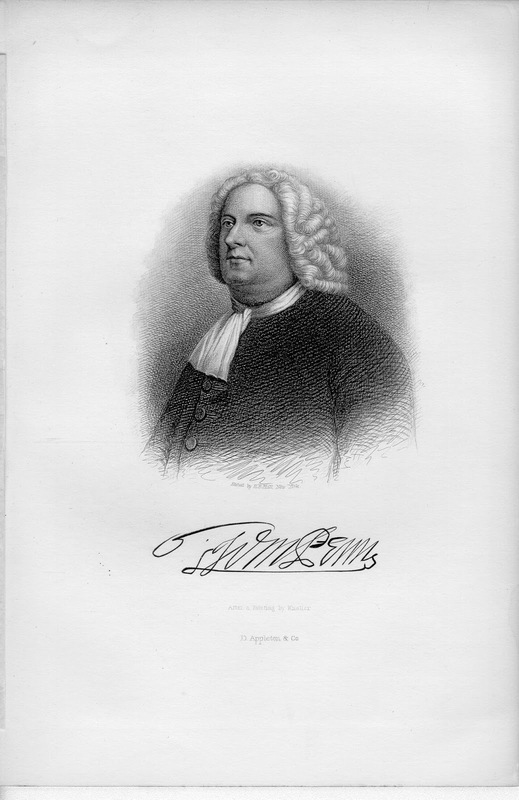 Penn then became involved in a controversy with Thomas Vincent, a Presbyterian clergyman, who had openly reviled the Quakers from his pulpit. Vincent, satisfied with having disclosed his side of the argument, failed to call a second meeting, in consequence of which Penn issued "The Sandy Foundation Shaken," an attack upon "those generally believed and applauded doctrines of one God subsisting in three distinct and separate persons" of the impossibility of God's pardoning sinners without a plenary satisfaction" and of the justification of impure persons by an imputative righteousness." This work caused great excitement by its bold opposition to the doctrine of the Trinity. Through the influence of the bishop of London and other high dignitaries of the church he was imprisoned in the Tower for more than eight months. During this time he wrote his principal and most popular theological work. "No Cross, no Crown; a Discourse showing the Nature and Discipline of the Holy Cross of Christ" (1688), which was soon followed by his"Innocency with her Open Face," a brief and vigorous reply to several answers to his "Sandy Foundation Shaken." These works increased the public interest in him, and his release was ordered through the influence of the Duke of York. He then went to Ireland on business, and while he was there he succeeded in effecting the release of imprisoned Quakers through his influence with old friends at court. On his return he became reconciled with his father, and thereafter lived on good terms with him. Early in 1670 Penn again fell into trouble by preaching in the street in violation of the Conventicle act. He was promptly arrested with Captain William Mead and taken before the lord-mayor, who sent them to the Old Bailey. In the remarkable trial that followed, the jury, who were kept for two days and nights without food, fire, or water, brought in a verdict of not guilty, for which each juryman was fined forty marks and sent to Newgate, while Penn and Mead were also fined and imprisoned for contempt in wearing their hats in presence of the court. They appealed to the court of common pleas, where the decision of the lower court was reversed, and the great principle of English law was established, that it is the right of the jury to judge of the evidence independently of the dictation or direction of the court. On being liberated, Penn at once returned to the bedside of his father, who died in the course of a few days, bequeathing to his son a property of £1,500 a year. Penn was again arrested in March, 1671, for preaching in a meeting-house in London, and committed to the Tower. He was tried under the Conventicle act, but acquitted for want of testimony, and on his refusing to take the oath of allegiance, owing to conscientious scruples about swearing, was sentenced to Newgate for six months. He spent his time there in writing "The Great Case of Liberty of Conscience," "Truth rescued from Imposture," "A Postscript to 'Truth Exalted, '" and "An Apology for the Quakers." At the expiration of his imprisonment he spent a short time in Holland and Germany, where he was active in making converts, but he soon returned to England, and early in the spring of 1672 he married Guliehna Maria, a daughter of Sir William Springett. At first, he resided in Rickmansworth, in Hertfordshire, and then he settled in Dorminghurst, in Sussex. During the ensuing few years he devoted much time to itinerant preaching, and published about twenty-six controversial works, some of which displayed great ability, and two political volumes, a "Treatise on Oaths" (1672) and "England's Present Interest Considered" (1672). He also had a controversy with Thomas Hicks, a Baptist preacher, in London, and published his "Reason against Railing and Truth against Fiction," and " The Counterfeit Christian Detected." The Birth of Pennsylvania by Jean Leon Gerome Ferris, Circa 1680. William Penn, holding paper, standing and facing King Charles II, in the King's breakfast chamber at Whitehall. In 1674 a dispute arose between John Fenwick, agent and trustee of Edward Byllinge, concerning the proprietary rights in the Quaker colonies of New Jersey. 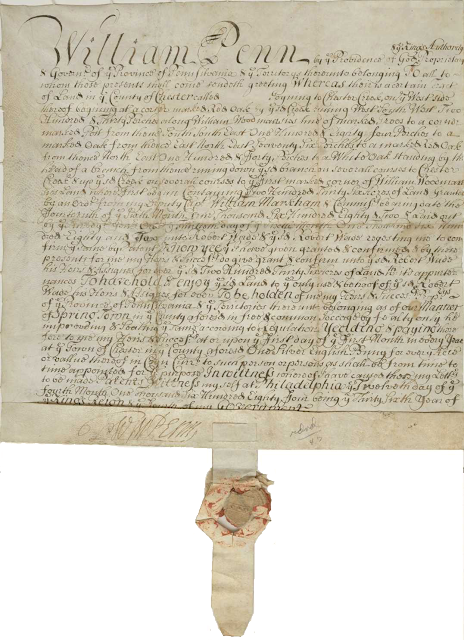 The matter was referred to William Penn for arbitration, and he decided in favor of Byllinge, who, becoming involved and unable to meet the demands that were made upon him, surrendered his property to his creditors. The latter appointed two trustees, and he himself selected Penn as a third to care for his interests. Penn showed great zeal in the work of colonization, and soon several vessels laden with emigrants were on their way to the New World. He then turned his attention to the congregations on the continent, and visited Holland and various parts of Germany, where he advocated colonization. On his return to England he continued to send emigrants to this country, and several additional ship-loads of settlers left England, making a total of more than 800 families. His acquaintance with Algernon Sidney, formed many years earlier on the continent, was now renewed, and Sidney became a frequent guest at Dorminghurst. In the elections in which Sidney was a candidate for Guildford and Bramber, respectively, Penn was one of his most active supporters. Although he was elected on both occasions, Sidney was not permitted to take his seat, and Penn, indignant at the treatment of his friend, and in consequence of other incidents, proposed to the king's council to receive a certain amount of territory on the Atlantic seaboard and in the interior of the country in lieu of money that was due his father, aggregating about £16,000. After numerous delays and various modifications of the original petition, on 24 February, 1681, Charles II. signed a charter that constituted Penn absolute proprietor of the territory in question in consideration of two beaver-skins to be given annually to the king. The name of New Wales was proposed by Penn for the province; but this being objected to, he suggested Sylvania, to which the king prefixed Penn, in honor of the great admiral. Direct appeal to the king and a proffer of twenty guineas to his secretary to have the name changed was unsuccessful. A liberal scheme of government and laws was drawn up by Penn, aided by Algernon Sidney. Organizations for emigration were established in England and on the continent, and negotiations were entered into with Penn for the sale of lands. 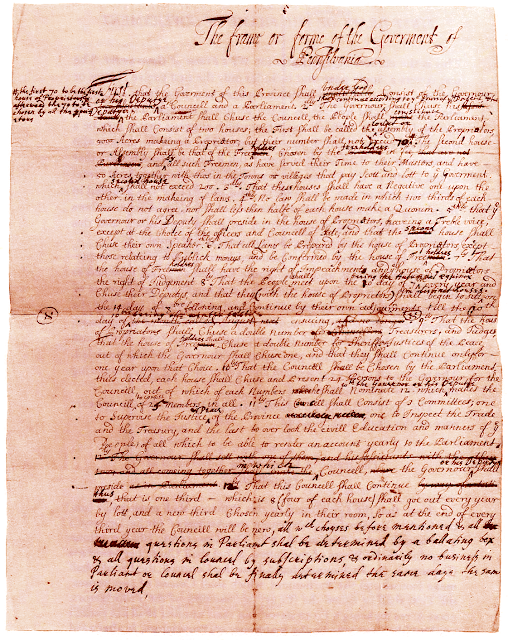 First Draft of the Frame of Government, Pennsylvania's first constitution written by Penn in England, Circa 1681 - The Papers of William Penn, Volume Two (1680–1684), University of Pennsylvania. In 1682 he sent out Captain William Markham with instructions to take possession of the province, to search out a convenient spot of ground on which to erect a governor's mansion, and to cultivate a friendly feeling with the Indians. In September, 1682, he himself set out from London on the " Welcome," and he reached Newcastle on the Delaware late in October, taking formal possession of the territory on the day after his arrival. The province was divided into counties, which were subdivided into building-lots, and the land was put up for sale at four pence an acre. He then selected, but not without some dissension, as a site for his capital the neck of land that lies at the junction of Delaware and Schuylkill rivers, which he purchased from the Swedes, and to which he gave the name of Philadelphia. Penn's landing was made at Dock creek, where the"Blue Anchor" tavern was built, beyond which the first ten houses, known as "Budd's Long Row," were erected. This place at once grew with wonderful rapidity, and within a year a hundred houses had been built. Meanwhile, (luring October, 1682, his famous treaty with the Indians was made. On the banks of the Delaware, at Shackamaxon (afterward Kensington, and now a part of the city), stood a great elm, where in earlier times the Indians had assembled on important occasions, and the name of the place signified, in the Indian language, the "locality of kings." Here representatives of the Delawares, Mingoes, and other Susquehanna tribes made with the Quakers a treaty of peace and friendship which, according to Voltaire, "was never sworn to and never broken." The influence of Penn was so great among the Indians that to be a follower of his was at all times a passport to their protection and hospitality. George Bancroft says that "while every other colony in the New World was visited in turn by the horrors of Indian warfare, no drop of Quaker blood was ever shed by a red man in Pennsylvania." "And thou. Philadelphia, the virgin settlement of this province, named before thou wast born, what love, what care, what service, and what travail hath there been to bring thee forth and preserve thee from such as would abuse and defile thee! My soul prays to God for thee, that thou mayest stand in the day of trial, that thy children may be blessed of the Lord, and thy people saved by his power." On his return to England he first sought to have the boundary-line between Maryland and Pennsylvania properly adjusted, but Charles II was then very near his end, and definite action could not be procured. Penn's patron and the friend of his father, the Duke of York, succeeded to the throne as James II, on 6 February, 1685, and soon after his accession set at liberty about 1,200 Quakers that had been imprisoned for their religious opinions. Shortly afterward the boundary difficulty was considered, and the disputed territory was divided into two equal parts, one of which was transferred to Lord Baltimore, and the other returned to the crown. Penn took up his residence at Kensington, and thereafter, until the king went into exile, he was at court almost daily. His chief object was to persuade the king to introduce into parliament a general act that should permit perfect freedom of opinion in every part of his dominions. His influence with James was well known, and every man with a real grievance found in him a counselor and friend. Through his efforts a pardon was granted to John Locke, who was then residing at the Hague; but Locke refused to accept it, claiming that he had done no wrong. Penn's success with the king being reported, it naturally made enemies for him, and it was circulated that he had matriculated at a Jesuit seminary, had taken holy orders in Rome, and officiated regularly at mass in the private chapel at Whitehall. Among other attacks on his character are those that were revived by Lord Macaulay in his "History of England." WILLIAM PENN. Manuscript Document Signed, “Wm Penn,” with his seal, on parchment, Philadelphia, April 12, 1684. Selling 236 acres in Chester County, Philadelphia, Pennsylvania, to Robert Wade, who had been the first Quaker to move to Pennsylvania. - Courtesy Seth Kaller, Inc.
Penn was sent by James to visit William of Orange, whom he endeavored to convert to his views of universal toleration, and, after visiting in Holland, he traveled through Rhineland, where he circulated reports of the success of his colony. 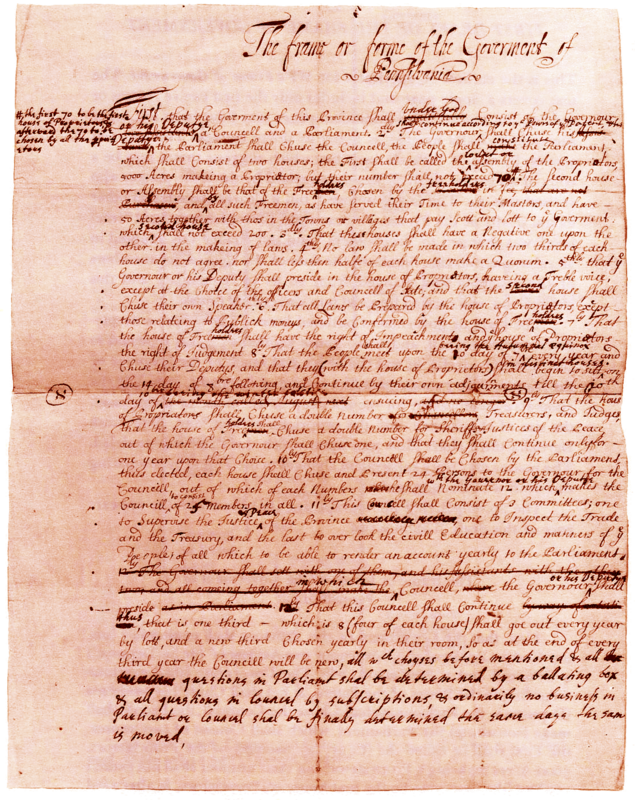 In April, 1687, the king issued a proclamation declaring liberty of conscience to all, and removing tests and penalties, which was largely the result of Penn's influence. Penn was the only one of James's court that remained in London after his flight, and he was called before the lords of council, who, finding nothing against him, save that he was a friend of James, required of him bonds for his appearance on the first day of the following term, when he was declared free of every charge that had been made against him. Subsequently a letter from the exiled James, requesting him to come to France, was intercepted, and he was again brought before the council in presence of King William. After a long examination, in which Penn declared his friendship for James though he did not approve of the latter's policy, and said he could not prevent the exile from writing to him, he was discharged. Later, on several occasions, he was arrested on the charge of being implicated in various plots, but invariably was discharged for lack of evidence. In 1692 he was deprived of his government, and his province was annexed to the colony of New York. On 23 February, 1694, his wife died, and he bore testimony to her virtuous life and Christian death in "An Account of the Blessed End of my Dear Wife, Gulielma Maria Penn." In January, 1696, he married Hannah Callowhill, of Bristol, a Quaker lady, with whom he had long been acquainted. Meanwhile, in August, 1694, an order in council was made restoring to him his government. He then sent out William Markham as his deputy; but the arbitrary behavior of the latter made trouble, so that Penn, on 9 September, 1699, with his wife and daughter Letitia, sailed on the "Canterbury" for Pennsylvania. 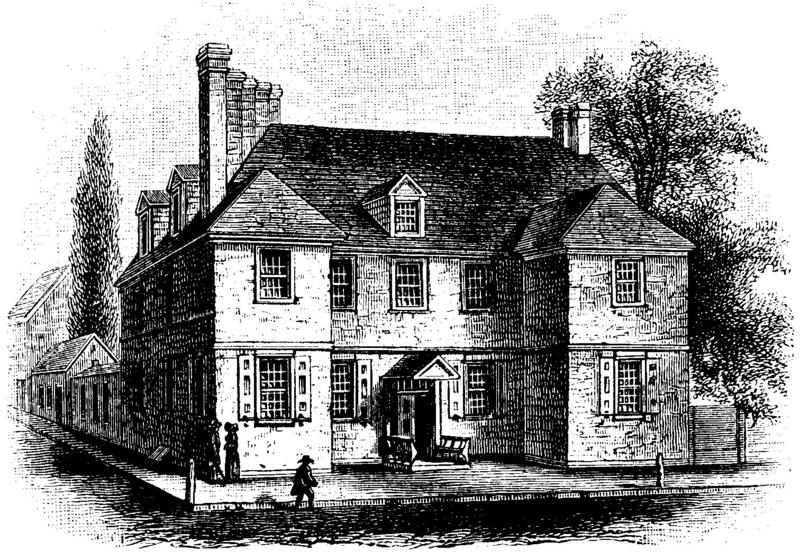 On their arrival at Philadelphia, the governor and his family went to lodge at Edward Shippen's, where they remained about a month. 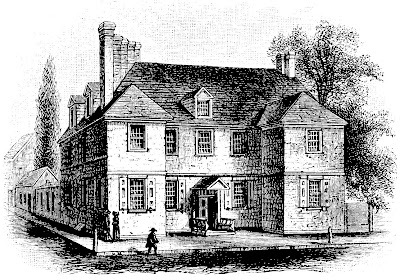 Penn then went to reside in what is known as the Slate-roof house, on Second street, between Chestnut and Walnut, at the south-cast corner of Norris's alley, shown in the accompanying illustration. Here was born, about two months after they landed, his son John, the only one of his children that was a native of this country, who was therefore called "the American." Difficulties that had existed prior to his arrival regarding the government of the province now disappeared, and peace and order soon prevailed throughout the colony. He gave his attention to various reforms, and especially to the amelioration of the condition of the Indians and Negroes. 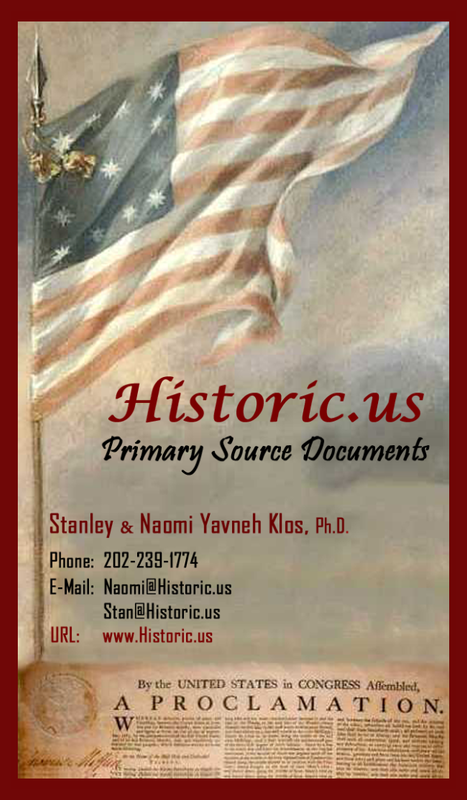 In 1701 a treaty was made with the Potomac Indians, and also one with the Five Nations, establishing commercial transactions between the natives and the colonists through authorized representatives. Information that a bill had been introduced in the house of lords converting all of the proprietary governments into crown colonies led to his return to England, but on his arrival the project that caused his leaving the colony had been dropped. Soon afterward he sent his son William to Philadelphia to represent him, but the latter so disgraced his father by his notorious conduct that he was sent home. Other troubles followed, including a false claim against him by his steward, rather than pay which he allowed himself to be committed to the Fleet prison in 1708. Later he became so reduced that he proposed to sell the colony to Queen Anne for £20,000, and, failing in this, had endeavored to secure the promise of a salary of £600 annually as governor, His health, seriously injured by his confinement in the Fleet, now grew worse, and, finding that the country air Of Berkshire agreed best with him, he settled in Ruscombe. Early in 1712 he was stricken with paralysis, and other shocks followed that so affected him that much of the time he was deprived of his memory and of the power of motion. In this condition ha lingered for six years, sustained and aided by his wife, who managed his business affairs for him. He was buried in Jordan's burying-ground, in Buckinghamshire, by the side of his first wife and Springett, his first-born and favorite son. An effort was made to have the remains of William Penn brought to Philadelphia, to rest there beneath some imposing monument. The little graveyard in Buckinghamshire was discovered, but "no monumental marble, or even simple headstone, marks the spot where the founder of Pennsylvania found at last that rest and freedom from the persecution he had experienced in his lifetime." In the original plan of Philadelphia, Penn placed a square of ten acres at the intersection of Broad and High (now Market) streets, but in the course of time the park was absorbed for building purposes, until only Penn square remained, on which the Philadelphia public buildings have long been in process of construction. These buildings were completed in 1892, and on the summit of the dome there is to be placed a colossal bronze statue of Penn, thirty-six feet high. It was designed by Alexander Caulder, and will weigh thirty tons. The figure is in a speaking attitude, and the left hand is represented as holding the original charter of the city of Philadelphia. As the statue is intended to personate him in his relation to the city rather than to the state, this was deemed the most appropriate symbol. In 1726 appeared "A Collection of the Works of William Penn, to which is prefixed a Journal of his Life, with many Original Letters and Papers not before Published" (2 vols., London), and in 1771 there were published "Select Works of William Penn, to which is prefixed a Journal of his Life"; also, in 1782, his "Select Works with a Life" were issued in five volumes, and again in 1825 in three volumes. See "Vie de Guillaume Penn," by Jean Marsillac (Paris, 1791; translated into German by Carl J. Friedrich, Strasburg, 1793) ; Thomas Clarkson's "Memoirs of the Public and Private Life of William Penn" (London, 1813); Mason L. Weems's "Life of William Penn" (Philadelphia. 1822) ; the " Life" by Joseph Barker (London, 1852); and George E. Ellis, in Sparks's "American Biography" (2d series, vol. xii., Boston, 1847); Samuel M. Janney, "Life and Select Correspondence of William Penn " (Philadelphia, 1852) : William Hepworth Dixon's " William Penn, an Historical Biography founded on Family and State Papers" (new ed., London, 1856); "Inquiry into the Evidence of the Charges brought by Lord Nacaulay against William Penn," by James Paget (Edinburgh, 1858); and "William Penn," by Robert J. Burdette (New York, 1882). For a full account of William Penn's writings and of those which relate to him, see Joseph Smith's "Catalogue of Friends' Books," vol. ii., pp. 282-326. --His second wife, Hannah Penn, died in 1733, was the daughter of Thomas Callowhill, a Bristol merchant. She accompanied her husband to Pennsylvania in 1699, and lived in great style, both in Philadelphia and in Pennsbury Manor, a beautiful estate situated in Bucks county, on the river Delaware. After Penn's death, during the minority of her children, as sole executrix, she assumed the management of the colonial affairs, performing this difficult task with rare tact and business capacity. Her deputy in Pennsylvania from 1718 till 1727 was Sir William Keith (q. v.). 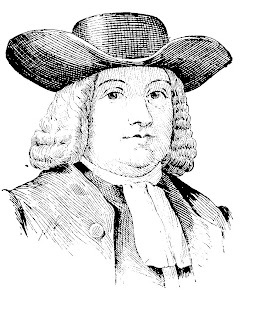 --The founder of Pennsylvania had several children that died in his lifetime.--His eldest surviving son, William Penn, born about 1676; died in Liege in 1720, came to the colony with Lieutenant-Governor Evans, arriving 2 February, 1704, and was made a member of the provincial council on the 8th. As such he joined in a declaration that a clause in his father's instructions suspending the operation of laws passed by the lieutenant-governor until the proprietor's pleasure be known was illegal and void. He raised a militia company, but, being presented before the corporation of the city of Philadelphia, the chief men in which were unfriendly to his father, for disorder at a tavern, he took offence and returned to England. He was an unsuccessful candidate for parliament. On his mother's side he was related to the wife of Lord Fairfax, and engaged with him and others in a project to recover sunken treasure. By various means he added to his father's financial embarrassment, and he was obliged to sell the manor of Williamstadt, which had been laid out for him at the founding of the colony. The estate of Shanagarry, County Cork, Ireland, which had descended from Admiral Penn, and certain other property, being deemed a handsome provision for him, all but 40,000 acres of the American estate were left to the founder's children by his second wife after payment of his debts, the powers of government being devised to the Earl of Oxford and Earl Powlett to sell; but the heir-at-law contested this, and issued a fresh commission to the lieutenant-governor, in which he declared himself a member of the Church of England. By advice of the assembly, the commission was not proclaimed. Subsequently an order from the regents of Great Britain was obtained continuing the lieutenant-governor in office. This William Penn left three children. 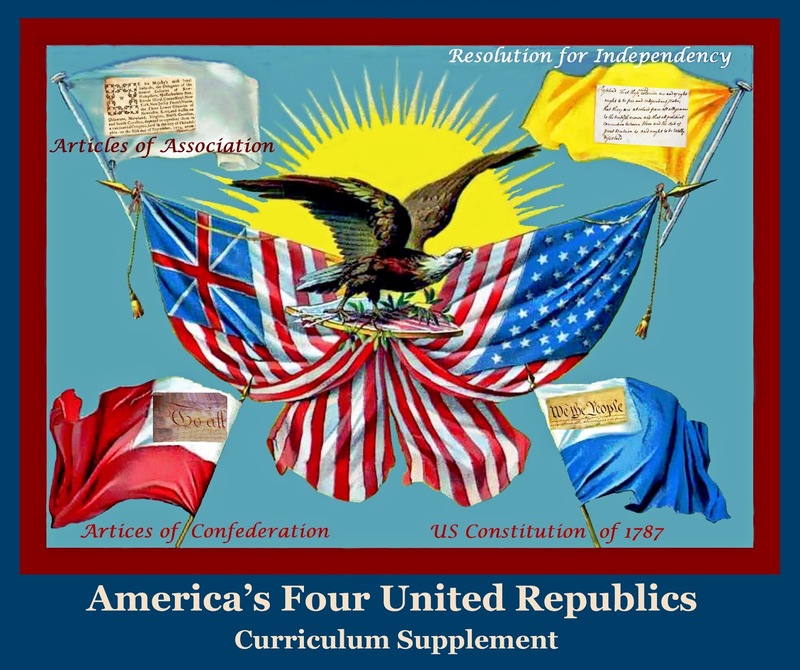 Edited By: Naomi Yavneh Klos, Ph.D.
Fourth United American Republic: The United States of America: We the People was formed by 11 states on March 4th, 1789 (North Carolina and Rhode Island joined in November 1789 and May 1790, respectively), with the enactment of the U.S. Constitution of 1787. The fourth and current United States Republic governs through the U.S. House of Representatives and Senate in Congress Assembled, the U.S. President and Commander-in-Chief, and the U.S. Supreme Court. George Washington served as the Republic's first President and Commander-in-Chief. --His eldest son, SPRINGETT Penn, born in England; died in Dublin, Ireland, 8 February, 1731, succeeded to his father's claims, and was by many persons considered the rightful governor-in-chief. Sir William Keith, the lieutenant-governor, caused a large tract of land on the frontier to be laid out for him, and called Springettsbury Manor. In 1725, with the widow and executrix of the founder, he nominated Patrick Gordon as Keith's successor, and obtained confirmation of the appointment by the crown. The will of the founder was established by decree of the court of exchequer in 1727, and a compromise between the two branches of the family was in process of adjustment at his death. --Springett's brother and heir, William Penn, born in 1703 ; died in Shanagarry, Ireland, 6 February, 1746, executed for £5,500 a release to John, Thomas, and Richard Penn, dated 23 September, 1731. He returned to the Society of Friends on marrying Christiana, daughter of Alexander Forbes, a merchant in London, on 7 December, 1732. After her death he married Ann Vaux, 13 December, 1736, by whom he had an only son, who died without issue, whereupon Christiana Guliehna, wife of Peter Gaskell and daughter of William and Christiana Penn, became the heiress at common law of the founder. --William the founder's eldest son by his second wife, John Penn, called " the American," born in Philadelphia, Pennsylvania, 29 February, 1700; died in England in October, 1746, by his mother's appointment received half of the proprietaryship, and was confirmed in the enjoyment of it by the paying of the mortgage, by the annulling of the agreement to sell the powers of government, by compromise with the elder branch of the family, by the establishment of a provisional boundary-line with Maryland, and by Indian treaties that opened all the region required for settlements. John Penn came to Pennsylvania in September, 1734, but returned to England the following year. During his stay he attended the meetings of the provincial council. He appears to have been the only descendant of William Penn in the male line that remained a Quaker. He died without issue, leaving his rights in the province and lower counties to his brother Thomas Penn, born in England in 1702; died there, 21 March, 1775. Thomas had originally only one sixth of the proprietaryship, but it was increased to a fourth by the death of a younger brother in infancy. To manage the estate he came to the colony in 1732 with power of attorney from John and Richard, and on his arrival took a seat in the council. He remained until August, 1741. Subsequently there was a long struggle between the proprietaries and the assembly of Pennsylvania, chiefly as to the taxation of the Penn estates. In 1764 the assembly petitioned the king to assume the government, but the crown let the powers remain with the proprietaries. Mason and Dixon's line, run in 1767 and confirmed in 1769, ended the boundary dispute with Maryland, and the treaty of Fort Stanwix in 1768 extinguished the Indian claim to the whole region of the Alleghanies from New York to Virginia, so that Thomas Penn, with his colleague holding a fourth interest, was the feudal lord of more than 25,000,000 acres, nearly a quarter of a million people, and the largest town in the American colonies. When he was about fifty years old he married Lady Juliana, daughter of the first Earl of Pomfret. --Thomas's son, John Penn, born in England, 23 February, 1760; died in Stoke Pogis, 21 June, 1834, succeeded to his father's interests, but, with his cousin, lost the proprietaryship and governorship by the American Revolution. Penn was a graduate of Cambridge, and for some time governor of the island of Portland, where he built Pennsylvania castle. He was a member of parliament in 1802. He published a tragedy, some pamphlets, and a volume of poems, and received the degree of LL.D. from Cambridge in 1811. .--William the founder's third son by his second wife, Richard Penn, born about 1710; died in England in 1771, was also a proprietary and titular governor of Pennsylvania and the counties of New Castle, Kent, and Sussex on Delaware river. He married Hannah, daughter of John Lardner, and had two sons. The eldest, John Penn, lieutenant-governor of Pennsylvania, born in London, 14 July, 1729 ; died in Bucks county, Pennsylvania, 9 February, 1795, married clandestinely while he was at school, but was separated from his wife by his uncle, Thomas Penn, and went to the continent, finishing his education at the university in Geneva. He was then sent to Pennsylvania, and on 6 February, 1753, became a member of the provincial council, with the rank of first member thereof, and succession to its presidency in case of a vacancy in the office of lieutenant-governor. He was one of the commissioners to the congress at Albany in 1754. He left the colony after Braddock's defeat, but seven years afterward returned as lieutenant-govern-or, arriving on 30 October, 1763. The first year of his term witnessed a state of affairs that threatened the existence of civil government. The assembly, controlled by the Quakers, failed to satisfy the Scotch-Irish on the frontier, who saw large sums of money, lavished in presents to Indians while they lay destitute from an Indian war. Benjamin Franklin for its president. The happiest event of Penn's administration was the treaty with the Indians at Fort Stanwix in 1768. On the death of his father he embarked for England on 4 May, 1771, leaving the government to the council; but in August, 1773, he returned to Pennsylvania as governor in his own right and by deputation from his uncle. In respect to the Revolutionary contest, he attempted to steer a middle course. He was opposed to taxation without representation, but his first overt act might have caused the ministry to replace the proprietary by a royal government. In February, 1775, he besought the assembly to send a petition from their own body seeking redress of grievances. 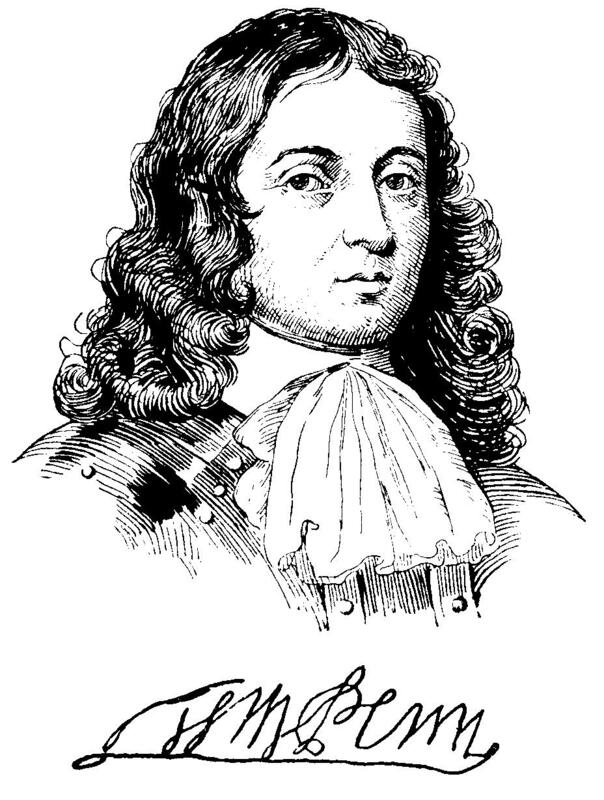 On 30 June of that year the assembly, without troubling Penn for his consent, provided for arming the province, and appointed a committee of safety, which thenceforth was supreme in Pennsylvania ; but Penn's council continued to meet until the following September. 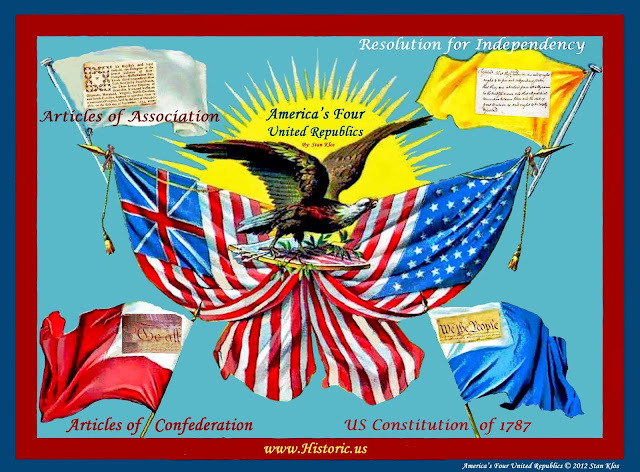 Within a month after the Declaration of Independence a constitutional convention met, and vested the government of Pennsylvania in a supreme executive council, choosing its own president and the officers of state. Penn offered no other resistance than refusal to recognize the new authority. Nevertheless, when Howe's army was expected in Philadelphia, it was thought inexpedient to leave such important instruments in British hands as a regularly commissioned governor and chief justice; so Chew and himself were arrested, 12 August, 1777, on the recommendation of congress, but they were released on 15 May, 1778. On 28 June, 1779, the legislature of Pennsylvania transferred to the state the property in the soil, restricted the possessions of the Penns to such manors, or tenths, as had been set apart for them prior to the Declaration of Independence, and also their purchases from private parties, and abolished quit-rents except within the manors. It voted in remuneration for this the sum of £130,000 to the heirs and devisees of Thomas and Richard Penn, to be paid three years after the establishment of peace. In addition, the British government created an annuity of £4,000, which has only recently been commuted. John Penn's branch of the family was entitled to a fourth of these sums, and the estates in Philadelphia and elsewhere were considerable; so that he was enabled to live comfortably the rest of his life at " Lansdowne." or at his city residence. He was buried under the floor of Christ church, Philadelphia, but his remains were afterward removed to England. --Another son of the founder by his second wife, Richard Penn, lieutenant-governor of Pennsylvania, born in England in 1735; died in Richmond, Surrey, England, 27 May, 1811, spent some time at St. John's college, Cambridge, and was intended for the legal profession, but relinquished that study. He accompanied his brother to Pennsylvania in 1763, and was qualified as a councilor on 12 January, 1764. After an absence of two years in England he was appointed by his uncle and brother lieutenant-governor of Pennsylvania, and arriving the second time in Philadelphia on 16 October, 1771, made himself the most popular of his family. All his dealings with the provincial assembly were very friendly. Armor, in his " Lives of the Governors," says: "He was especially attentive to the commercial interests of the colony, and during his administration a degree of unexampled prosperity prevailed." He had a dispute with his brother concerning his father's will, and for some time after the arrival of John, by whom he was superseded in the governorship in August, 1773, Richard did not meet him, but the two were finally reconciled. Richard Penn's feelings were enlisted against the oppressive acts of the British government. The eldest, William Penn, born 23 June, 1776; died in Nelson Square, Southwark, England, 17 September, 1845, entered St. John's college, Cambridge, but left the university without taking a degree, and devoted himself to literature, but became very intemperate. He came to Pennsylvania in 1808, spending some time in Philadelphia and in the interior of the state, and marrying there. After his return to England he was for a long time imprisoned for debt.--His brother, Richard, died in Richmond, England, 21 April, 1863, was for many years employed in the British colonial department, and was author of "Maxims and Hints on Angling, Chess, Shooting, and other Matters, also Miseries of Fishing." He was a fellow of the Royal society. -- -- Edited Appletons Encyclopedia, by Louis Klos. Copyright © 1999-2013 by Stan Klos, All Rights Reserved. Picture Window theme. Powered by Blogger.